Appearance: Wildcats look like wildcats in our world, just bipedal and clothed. Life Span: Most wildcats seem to live longer than most other creatures- about as long as hares and maybe even badgers. Diet: Wildcats eat meat, but Gingevere, a good wildcat, was a vegetarian. Typical Personality: Many wildcats are semi-cowardly, and a tad weak-willed. They tend to be very intelligent and sly, as well as good leaders (if they're vermin). Personalities range all over, however, and they can be as cruel as Tsarmina or as gentle as Gingevere. Appearance: Wildcats have gray-brown fur with dark stripes and a thick, 29cm, blunt-tipped tail. They are about 56 cm long on average, with males weighing around 5 kg and females around 4 kg. 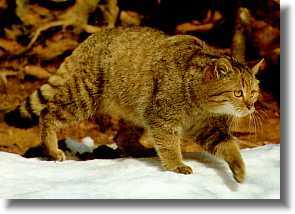 They look very much like domestic cats, and the species name Felis silvestris is often used for domestic cats as well as wildcats. Life Span: While most die earlier, wildcats can live 10 - 12 years in the wild. Diet: The wildcat eats mostly hares, rabbits, and small mammals, though they'll also eat birds and fresh roadkill. Habitat: Wildcats like areas with varied habitats, such as the edges of moorlands, with pasture, scrub and forests. They den among boulders and rocky cairns, or in old fox earths, badgers setts, peat hags, or tree roots. Territories can be 3 - 10 square km. Typical Personality: Wildcats are shy and wary as well as solitary and territorial. Habits: Wildcats are semi-nocturnal, mostly active around dawn and dusk. They sometimes cache uneaten prey under fallen leaves or vegetation. Life Cycle: Each litter has about 2 - 5 kittens, which are usually born in May. 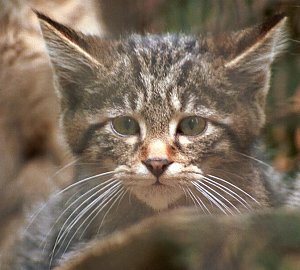 Wildcats only have one litter a year.